Both Sherwood and his wife Emeline were long dead when Cooley so blithely cast his aspersions upon their place of business and their characters. Historians know that Cooley had a habit of favoring a good story over boring facts. There is no evidence elsewhere that the Sherwoods were anything but law-abiding citizens, not in stories in the local press of the day nor in the written recollections of other Duluth pioneers. The captain was a native of New York who moved to Buffalo as a young man and eventually served eleven years as sheriff. There, he became friends with a young lawyer named Grover Cleveland, who was elected sheriff after Sherwood’s departure for Duluth. Cleveland went on to become the mayor of Buffalo, the governor of New York, and finally President of the United States. Apparently, the Erie County sheriff’s department at the time was known for graft and corruption, and Cleveland did not make much effort to change that. Whether Sherwood himself was dirty in any way is unknown. After Cleveland became president, the Sherwoods visited him in the White House. At any rate, the Sherwoods originally came to Duluth in 1869. 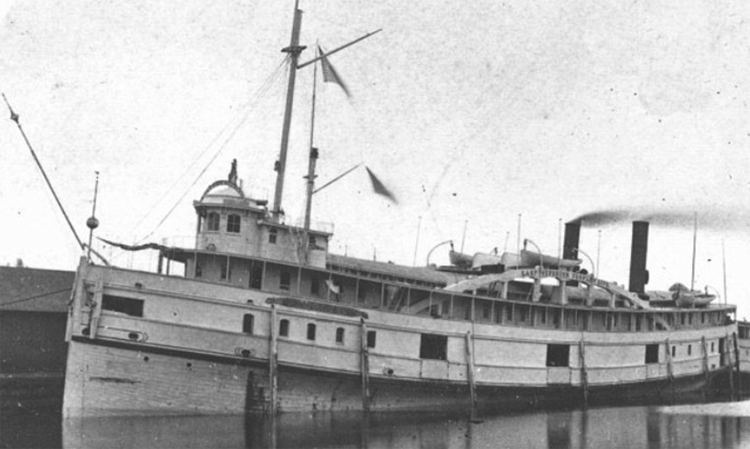 For a few years, the captain ran a freight and passenger yacht around the head of the lake and eventually opened a restaurant and saloon at 105 East Superior Street. He was locally famous for his singing voice, and so in demand that even pro-temperance folks begged him to perform at their events—which led to some sly jokes at their hypocrisy in the local rags. Mrs. Sherwood was a shrewd businesswoman in her own right, and owned quite a bit of real estate, acting as landlady at a handful of rooming houses downtown. A rosy 1895 Duluth News Tribune reminiscence directly contradicts Cooley’s later recollections. In the article, Sherwood’s saloon is remembered “for the excellent quality of his goods—liquid and solid—and it is said that though he did the most prosperous business of the kind in town his doors were never darkened by any of the tougher elements in society.” He reportedly kept the saloon’s liquor in a cupboard that hung on the wall of the front room, and if you wanted a drink you had to “come to the box” to be served. No matter how fat your wallet, no one was permitted to drink at the tables or sitting down. When the proprietor went fishing, the cupboard ran on the honor system. The saloon also housed a raven—which was reportedly stolen sometime in 1873—and a five-toed rooster. Students of Duluth’s historical racial dynamics might be familiar with a long-standing suspicion of presumed hooligans from Chicago, but Cooley’s mention of that attitude in nascent Duluth has only one existing corroboration: a very oblique mention in the Duluth Minnesotian-Herald on July 14, 1877. “Capt. J. McLeod, at present First Mate of the Peerless, had, last Wednesday, a difference of opinion with some negroes employed on the same steamer. His arguments were convincing.” Whether razors actually were employed or the boat hands were Chicago hooligans remains a mystery. While we may never know exactly what went on inside Sherwood’s saloon, we do know the Sherwoods had a much more interesting encounter with Chicago’s criminal element in their sunset years.